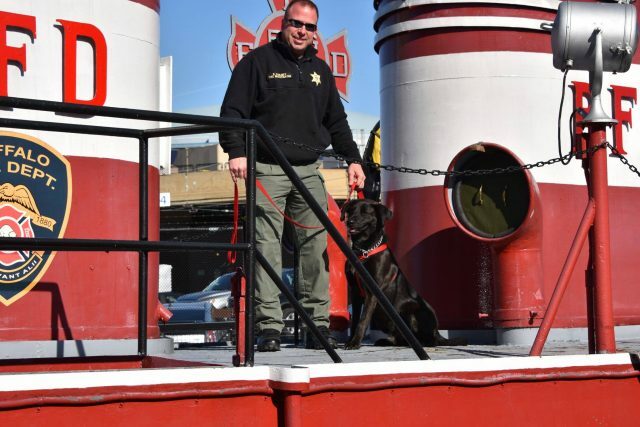 Peppertree Dog serving as NYS Accelerant Detection Canine, congratulations Axe and Scott. 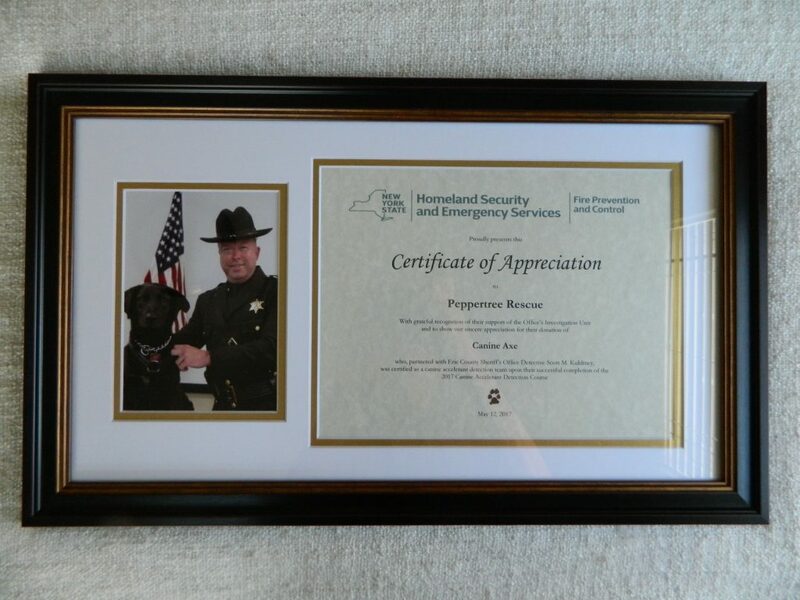 Peppertree Rescue is proud to share that Axe, formerly known as Rover, graduated from the NYS Academy of Fire Science’s Canine Accelerant Detection Course in Montour Falls, NY on May 12th, 2017 along with several other rescue dogs, including two from Saratoga County Animal Shelter and one from Mohawk Hudson Humane Society. Axe’s partner will be Officer Scott Kuhlmey and they will stationed in the Buffalo area with the Erie County Sheriff’s Office. Scott, Axe and Wendy at graduation! When Peppertree received the call in February from the NYS Department of Homeland Security and Emergency Services we were not sure what to expect. Fire Investigator Michael Knowlton had seen him on our website and recognized him as the type of dog with the drive needed to do the job. Failed placements, multiple fosters, extended time in boarding, a history of over-excitement, and even a bite record – Axe, then Rover, was not a typical family dog. Axe wanted, and needed, a job. And thankfully one found him, his toy obsession and go go go attitude made him the perfect candidate for their program. Axe did not have the easiest start to life. 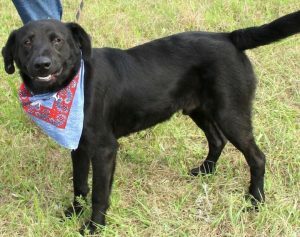 Arriving heartworm positive at Darlington County Humane Society in South Carolina it seemed like his options were limited. But the staff and volunteers at Darlington became his advocates, and they asked if they arranged for his heartworm treatment could he travel to NY to become a Peppertree dog? His smiling face and sweet demeanor had us saying yes, but we had no idea the depths that lurked behind that smile! From the moment of arrival Axe was admittedly a handful, his energy and intelligence translated to one dog that was easily bored and stressed, and when bored and stressed he did not always make the wisest choices. From picking fights with resident dogs to chasing anything that moved, Axe made it very clear that if he was not given things to do he would find things to do – and they were not always things we approved of. His foster family worked hard to keep him busy, and to try to tire him out but he seemed to have boundless energy. Axe was also very stressed out at clinics, over stimulated and just plain overwhelmed at times. 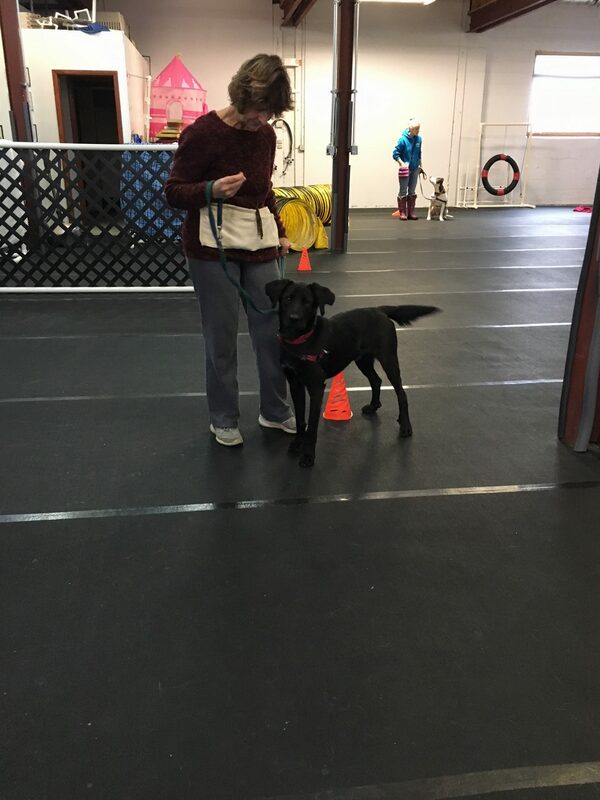 Becky Hutchins, CPDT-KA at Good Choice Dog Training in Albany, NY welcomed him in her foster dog class and he thrived there. He loved to learn and clearly had drive, and volunteers worked to give him opportunities to stay busy and work. But while we continued to learn about Axe and offer him all we could, we still were not sure what type of home he was meant for. His labby looks drew attention but nothing seemed right, until the NYS Department of Homeland Security came calling. Axe was met and assessed by Fire Investigator Michael Knowlton who knew immediately Axe was exactly what they were looking for. When the board of Peppertree asked what would happen if Axe did not pass his training, Fire Investigator Knowlton laughed and assured them he had no doubt he would pass. Axe was perfect. Axe training. Photos courtesy of Erie County Sheriff’s Office. Axe was partnered with Scott Kuhlmey and began his training. 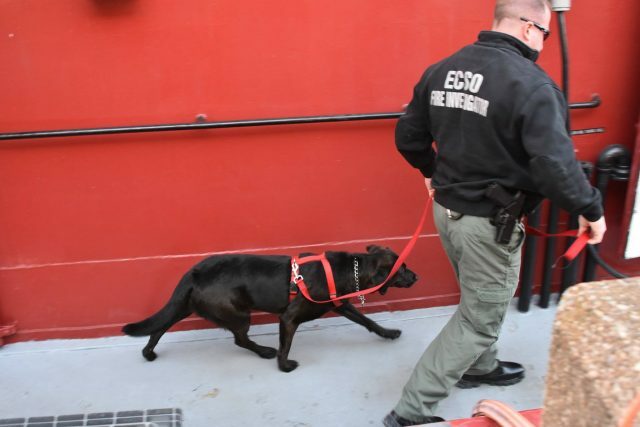 They got him used to boats, helicopters, large crowds and more as he learned to detect common liquid accelerants. As the positive updates and reports came in we knew Fire Investigator Knowlton was right, Axe was perfect. 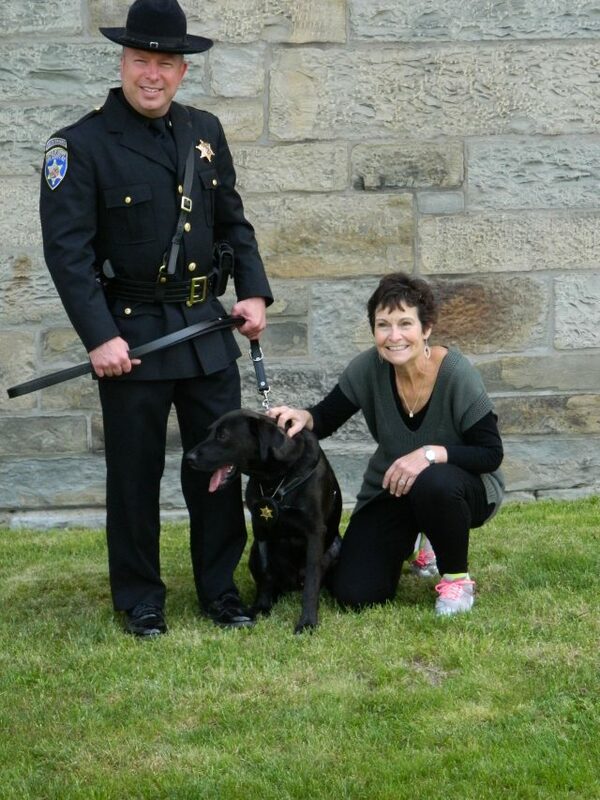 Axe with his new handler, Scott Kuhlmey. Photos courtesy of Erie County Sheriff’s Office. 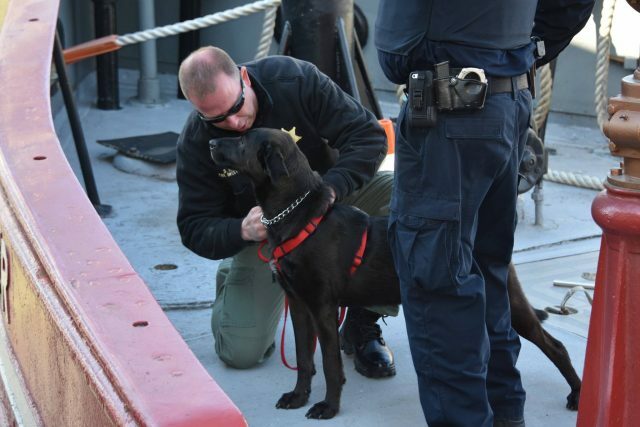 We would like to thank Fire Investigator Michael Knowlton and Deputy Chief William McGovern, Jr. for recognizing Axe’s potential and working with us to find this happy ending. We would also like to thank foster parents Wendy and Paul for going above and beyond with Axe, and working so hard with him, and Darlington County Humane Society in South Carolina for being his first advocates and taking him through his heartworm treatment. 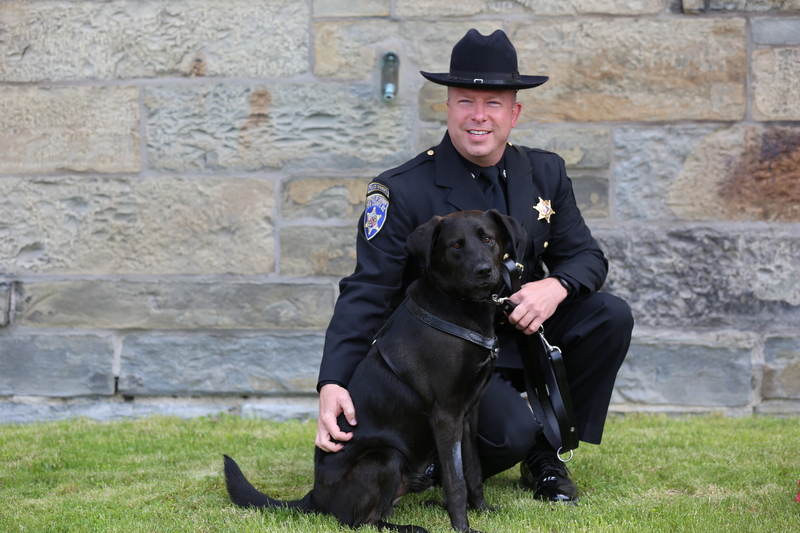 We would also like to congratulate Officer Scott Kuhlmey and Axe on all they have achieved, we are happy to have played a small part in making this happen and look forward to hearing about of all your ongoing good work.